1. Made of top genuine leather with stainless metal clasp buckle, classic & stylish design, makes your iWatch decent & elegant. 2. The bands come with upgraded secure connector, screw more precisely and tightly. 3. 42mm Apple Watch Band Men Made with 100% Premium Soft Craftsmanship Genuine Leather, Providing Amazingly Comfortable Feeling. For Apple Watch Band 42mm Compatible with For Apple watch 42mm Series 3 2 1. For iWatch bands 42mm designed for wrists 6.7 to 8.3 inches (172mm to 212mm). For Apple Watch Band 42mm series 3 is in a classic & stylish design, meets the need of casual or business. Made with 100% Premium Soft Craftsmanship Genuine Leather, Providing Amazingly Comfortable Feeling. 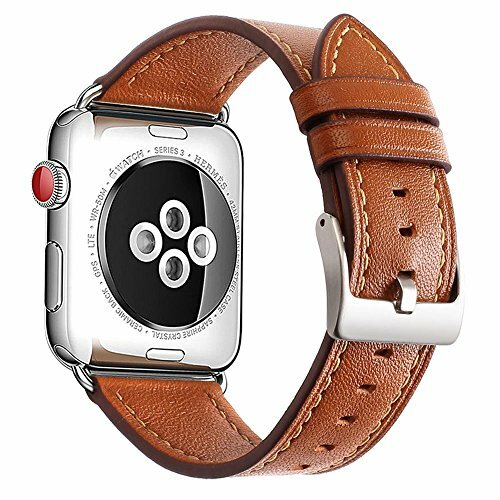 Leather For Apple Watch Band 42mm Warranty: One year warranty for a refund or replacement if any quality issue. If you have any questions about this product by Mkeke, contact us by completing and submitting the form below. If you are looking for a specif part number, please include it with your message.